During undergrad I was constantly abandoning calendars and agendas I had purchased because there was some aspect of them that didn't work for how I plan. That may sound super high maintenance but think about how often (and for how long) you have to organize your life. In an effort to boost my organization last year I made these dry erase wall organizers, and I have been dependent on them ever since. If you're looking to get more organized this year, here's a guide to a customizable DIY organization system that may take an hour to make, but will keep you organized for a lifetime. 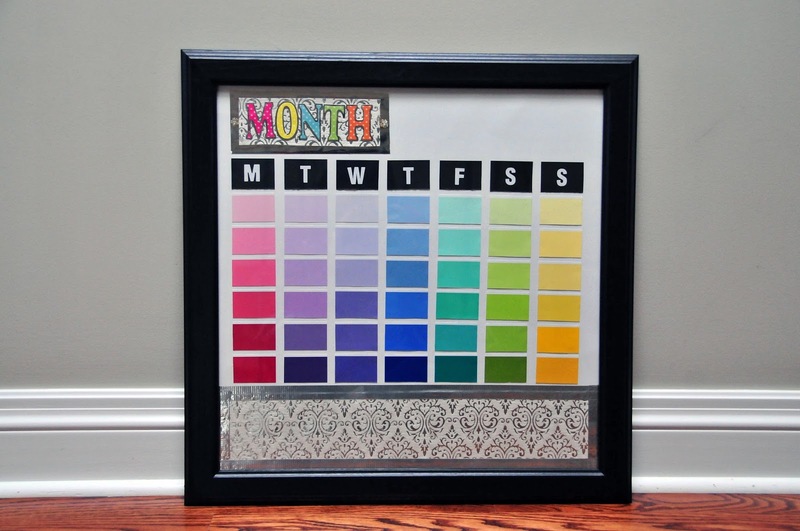 Cheesy lines aside, if you've ever been on Pinterest there's a 90% chance you've seen the DIY Paint Chip Calendar before. Those pins always caught my eye because I love all things DIY as well as anything that's ridiculously colourful. After seeing them pop up on Pinterest for the hundredth time I was inspired to make one, as well as a DIY To Do List, myself. No matter your artistic abilities, I promise these are incredibly satisfying to create and they'll be an organization system you'll actually WANT to use! Frames - The ones I used are from IKEA because I wanted large frames that were still relatively cheap. Any frame will work though as long as you're happy with the size! Bristol Board - Literally any craft store or anywhere they sell school supplies. Paint Chips - Wal-Mart (or any paint store/home decorating place). Stickers and Paper - Scrapbooking Materials section from Michael's. Scissors - ....I'm willing to bet you already have these. Some of the motivational/square paper products I used for my To Do List are from A Beautiful Mess's Messy Box, but you can find similar paper products at any craft store, or opt to make your own. I used double-sided scrapbooking adhesive squares to attach everything because it made it relatively easy to correct any placement mistakes, and because I have little patience for the inevitable mess that comes with using glue. Obviously it's best to start off by deciding what size frame you want to use. 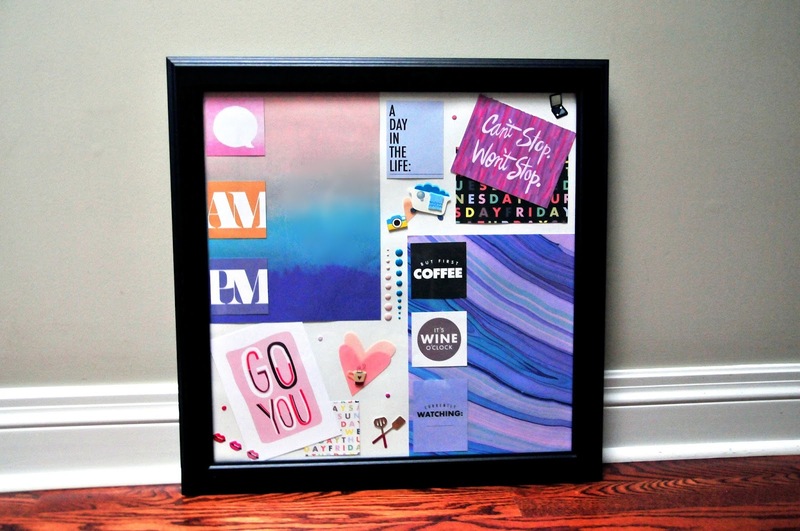 I knew I needed my calendar to be large and in charge so I chose a medium-size square frame. If your frame is new, you can use the paper insert that comes inside as a guideline to cut the bristol board down to the perfect size. 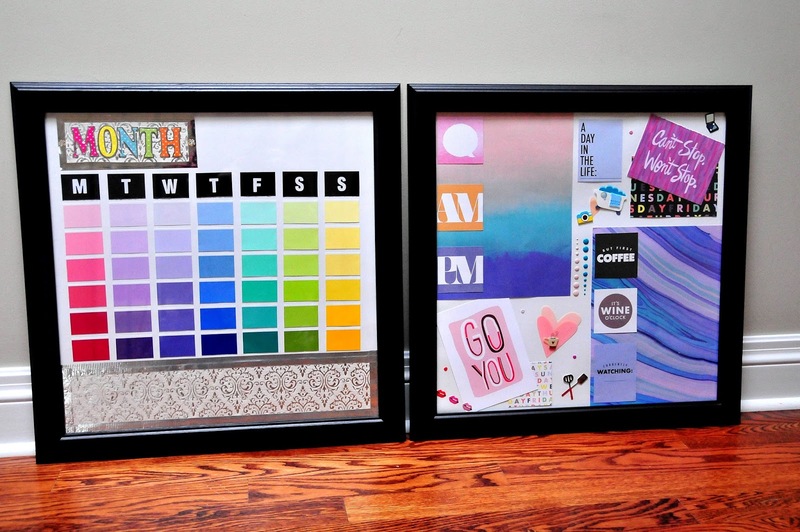 After that, just arrange your paint swatches on the bristol board and customize it however you would like! I personally labelled the days of the week, created a space to write the month (more for aesthetic reasons than anything else), and also added a section where I could write notes. I designed my calendar so that it's 6 weeks in length. This allows me to plan a couple of weeks into the next month, and helps me remember what's coming next. In addition, it lets me fit every month in its entirety onto the calendar; I realized there were some awkward transitions where the 1st was at the end of a week (for example, on a Sunday on my calendar), and therefore the month wouldn't fully fit on a 4-week calendar. Again, it's all personal preference though! I personally like to use both a daily to do list and a calendar so I separated them in order to allow for more space on both. My to do list is essentially a chaotic layering of motivational quotes coupled with room to write. For my planning purposes, I really needed a to do list that catered to different needs than the general planner I carry around daily that includes my class schedule, meetings, etc. Speech Bubble: Any correspondence: emails I have to respond to or send out, phone calls to make, appointments to book, etc. AM: Things I need to do in the morning. This might be a reminder about something that's not usually part of my routine, or something that I am horrible at remembering like taking medications. PM: The same as AM, but for the afternoon/evening. But First Coffee: School and work-related items. Even though I have a smaller agenda to write things like this in, I find there are always a couple of things that fall through the cracks if they're less urgent/pertinent (especially if they don't have to be done by a specific date!). It's Wine O'Clock: Anything social. Currently Watching: Important things on TV I can't miss (clearly the most important category)! Typically I like to use this space to write down the times and/or channels of special TV programs, and as a space to create a running list of TV and movie recommendations my friends have given me. In case this whole DIY still seems daunting to you, check out LaurDIY's DIY Wall Organizer video below which will give you a better idea of how to actually make these cool dry erase projects! 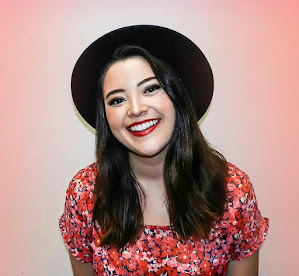 Her creation is a hybrid of a calendar and a to do list.